Shilbottle Community Hall is delighted to bring this exciting family show to the village, offering high quality entertainment for all ages at the beginning of the half term holiday. “Mavis Sparkle” follows on from the success of the “Snow Bear”, “Thumbelina” and “The Ugly Duckling” in previous years, and is an event not to miss. Tickets are limited for each of the two performances, so early booking is advisable for this enchanting show for children aged 4+ and their families. With a magician for a dad and a stargazer for a mum, no wonder there’s more to Mavis than meets the eye! 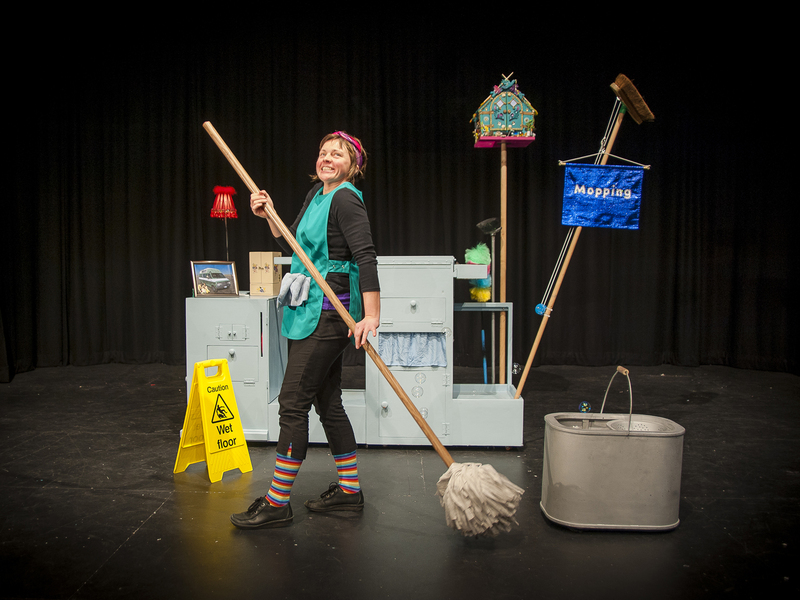 A feather duster in one hand and a few tricks up her sleeve, our chatty cleaner is moving ever closer to making her dreams come true. With a little help from her cheeky cuckoo clock, mischievous mop bucket, Spike the hedgehog and a nice cup of tea, Mavis is on a journey north to see nature’s biggest light show with her own eyes. M6’s cosmic production mixes magic, illusion, animation and laughter inspiring us all to dust away doubts, follow our dreams and reach for the stars! Written and directed by Gilly Baskeyfield and Dot Wood and performed by Eve Robertson, the show uses a combination of original storytelling, highly visual imagery and evocative music to ignite the imagination of children. Founded in 1977, Rochdale based M6 Theatre create original theatre productions that nurture the heart and challenge the mind of young audiences. They also produce short plays and powerful new dramas for older audiences. They tour their work nationally and internationally to venues and festivals and have teamed with Highlights Rural Touring Scheme to bring their latest, beautiful production to rural audiences.